This is not the time for this question yet. Or just a storm - or just... nothing?? 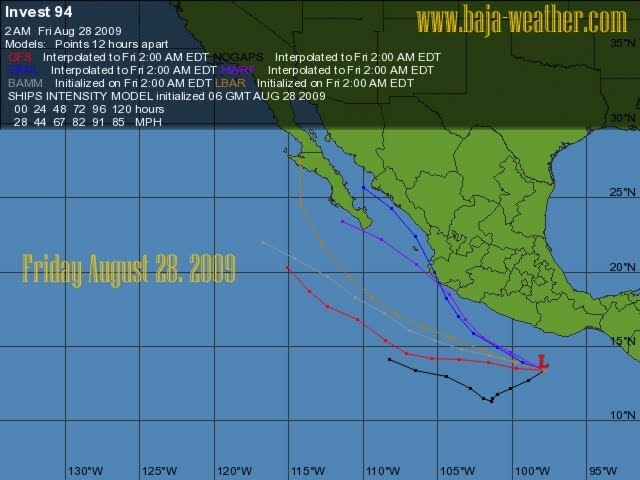 Invest 94 is out there way south and the models show a possibility to come up to us and touch Baja. The last days been several systems out there going away from Baja like Tropical Depression Hilda. Now we got south of Puerto Escondido and about 200+ miles off the coast a system worth watching (Lat: 13.4N, Lon:97.8W). According to NOOA "environmental conditions are expected to remain favorable for gradual development of this system as it moves West to West-Northwestwards near 10 miles per hour over the next couple of days" . Shower and thunderstorm activity associated with a broad area of low pressure about 950 miles south-southwest of the southern tip of Baja California has changed little during the past several hours. Upper level winds appear favorable for additional development of this system. There is a medium chance, 30% to 50%, of this system becoming a tropical cyclone during the next 48 hours.